Hand-thrown porcelain bowls, available in 3 sizes, 4 colours. (Grey not pictured). Handmade porcelain bowl in grey, size medium. Hand-thrown with natural ridges. Handmade porcelain bowl in pale blue, size medium. 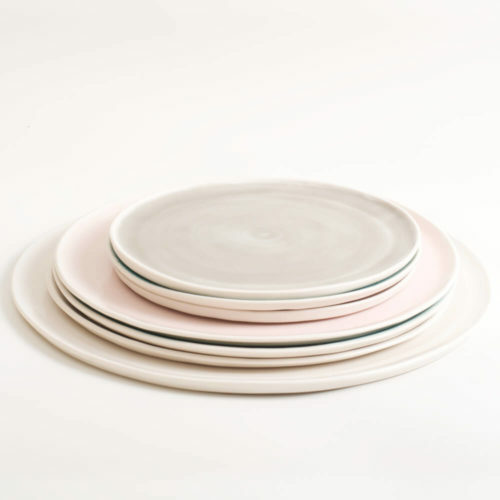 Hand-thrown in London with natural ridges. Handmade porcelain bowl with turquoise inside, size large. Hand-thrown with natural ridges. Beautiful on its own or as part of a mix and match set. 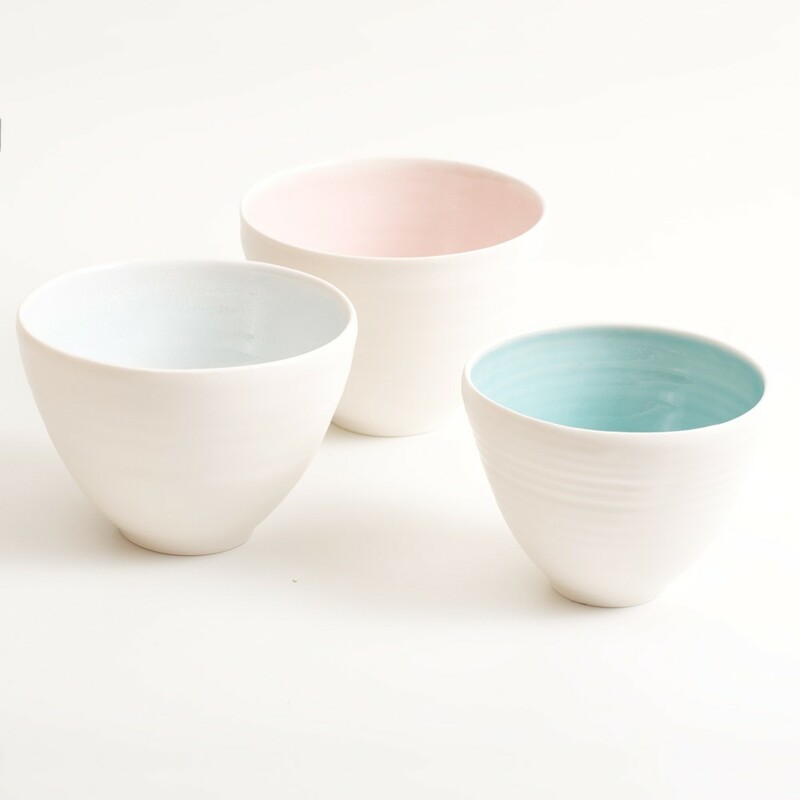 Hand-thrown porcelain bowls, available in 3 sizes, 4 colours. Turquoise shown here. Handmade porcelain bowl with turquoise inside, size medium. Hand-thrown with natural ridges. Beautiful on its own or as part of a mix and match set. Handmade porcelain bowl pink medium. Hand-thrown with natural ridges. Beautiful on its own or as part of a mix and match set. Handmade porcelain coloured deep bowl blue small. Hand-thrown with natural ridges. Beautiful on its own or as part of a mix and match set. Available in 3 sizes and 4 colours: Pink, blue, turquoise and grey. Handmade porcelain bowl with pink inside, size medium. Hand-thrown with natural ridges. Beautiful on its own or as part of a mix and match set. Available in 3 sizes and 4 colours: Pink, blue, turquoise and grey. Handmade porcelain bowl with turquoise inside, size large. Hand-thrown with natural ridges. Beautiful on its own or as part of a mix and match set. Available in 3 sizes and 4 colours: Pink, blue, turquoise and grey. See product listing for sizes and prices. Handmade porcelain bowl with pink inside. Hand-thrown with natural ridges. Beautiful on its own or as part of a mix and match set. Available in 3 sizes and 4 colours: Pink, blue, turquoise and grey. Handmade porcelain bowl with grey inside. Hand-thrown with natural ridges. Beautiful on its own or as part of a mix and match set. Available in 3 sizes and 4 colours: Pink, blue, turquoise and grey. Handmade porcelain bowl with blue inside, shown in close up. Hand-thrown with natural ridges. Beautiful on its own or as part of a mix and match set. Available in 3 sizes and 4 colours: Pink, blue, turquoise and grey. 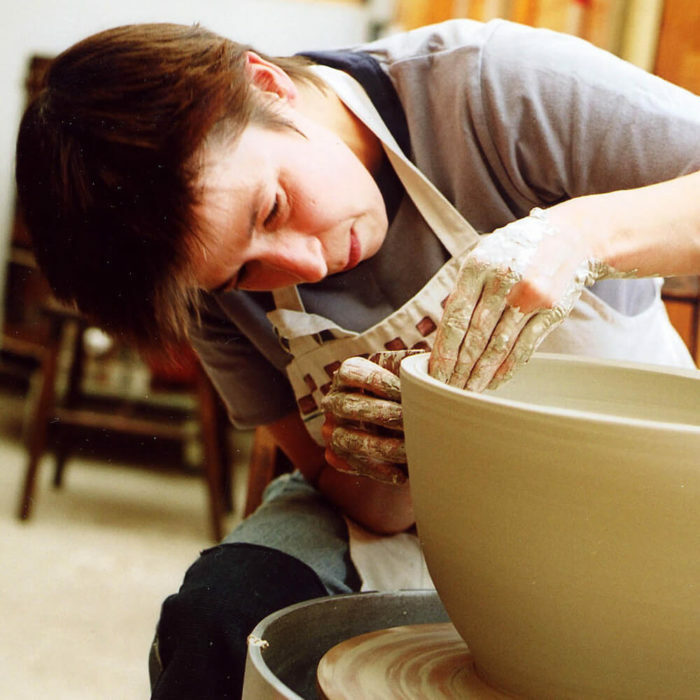 Handmade bowl with natural ridges, thrown on the potter’s wheel by Linda Bloomfield. Beautiful on its own or as part of a mix and match set. Available in 3 sizes and 4 colours: Pink, blue, turquoise and grey. This deep bowl has been hand-thrown on the wheel by Linda Bloomfield in her west London studio. Made in porcelain, the bowl has a jewel, or macaron, coloured glazes covering the inside, and a tactile satin matt glaze on the outside. As a former scientist, Linda makes her own glazes. These can gather in a pool of colour in the bottom of the bowl. The small bowl are great for desserts or nuts, the medium bowl is for soup or cereal, and the large bowl is an ideal size as an attractive salad bowl or for fruit. 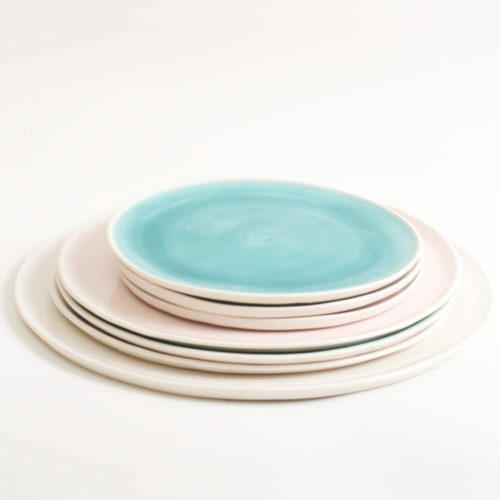 This handmade pottery from the UK is available in pale pink, pale blue, turquoise or grey. The bowls are also available as a set of four or six, one of each colour. If you like these deep bowls, you should have a look also at Linda’s shallow bows and dimpled range, all available in these same lovely colours. See the collection here. Beautiful yet very practical for every day use.